The filtration is similarly given with vertical as well as horizontal rotor position. While with the vertical basket position the separating liquid is drained through a filter cloth with an underneath installed supporting screen and will be discharged by filtrations holes inside the basket wall, this task is being taken over by a so-called sandwich-filtration element in the Krettek backflushing rotor. Here the drainage is also be made by a filter cloth and an underneath slotted bridge screen, but design and fixing inside the rotor are strongly different from the vertical peeler centrifuge. 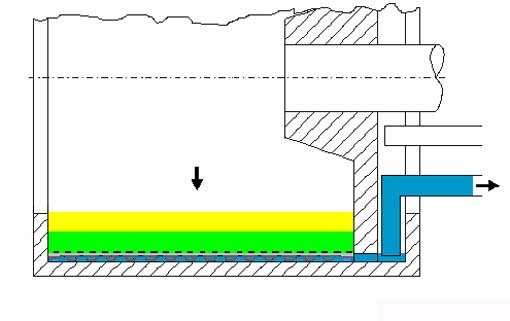 The filtrate will be collected on the unperforated rotor wall and flows in direction to the rotor bottom by axial installed channels, which are formed by the slotted bridge screen. The filtrate is collected in the backflushing chamber by advantageous arranged outlet holes. There it will be discharge by the pivoting filtrate peeler device. Due to the design the use of the backflushing rotor shows processing advantages like unbalanced filling or a regeneration of the residual layer. Further advantages are the higher g-force factor, a lower height of the filter cake in combination with a larger filter area. But we do not want to go more in detail at this point.